Among the city 's many spectacular beaches are Praia de Pajuҫara, famous for its natural pools, and Praia do Frances, in Marechal Deodoro, with calm seas on one side and strong surfing waves on the other. The native Tupi-Guarani tribe first named the region maҫayó or maҫaio-k, which means "covering the marsh". The Portuguese colonists who settled here in 1815 adopted this name, as well , and kept it when the town became the state capital in 1839. 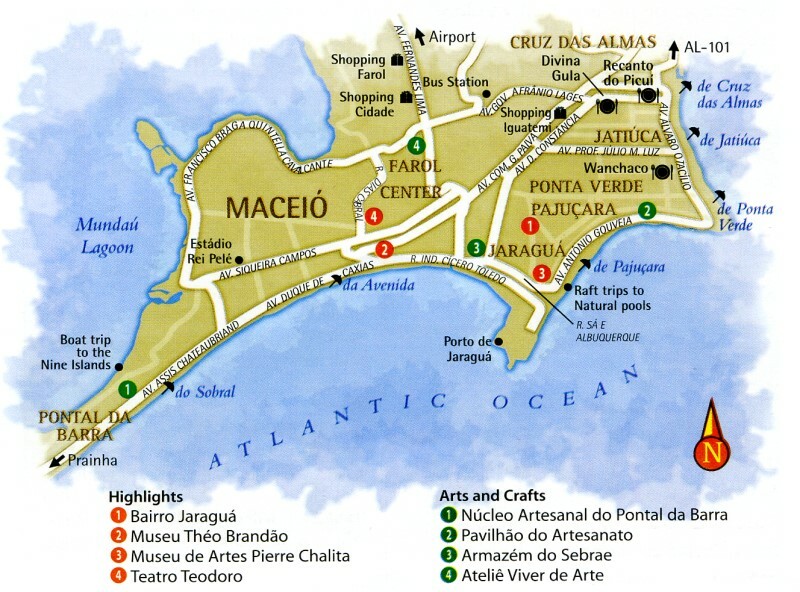 In addition to its own beachfront attractions, Maceió serves as a base for day trips to towns like Barra de São Miguel (40 kilometers, 25 miles) , Maragogi (130 kilometers, 81 miles), and Penedo (160 kilometers, 99 miles), all must-sees for visitors. Pajuҫara (2 kilometers from the city center), with its calm, reef- protected waters, is the best known of Maceió's beaches. At low tide, jangadas (rafts) depart from Pajuҫara for trips to the natural pools. Farther out from the center (4 kilometers) is vibrant Ponta Verde, a pristine, clear beach covered in coconut trees. Jatiúca, 6 kilometers from the center, is a popular locati on for surfing championships, and the site of the Lampião bar (famous for its all- night forró dances). With its strong waves and submerged reefs, Cruz das Almas (8 kilometers from the center) is another surfers' favorite. Pajuҫara and Jatiúca both have showers and jogging / bike paths. The traditional Feirinha de Artesanato de Pajuҫara began as a small, outdoor artisan market. In 2002, it was covered over and became a major marketplace, with around two hundred stalls selling a variety of crafts. The busiest time to go is late afternoon, when there are also forró shows. The market is held daily near the departure point of the jangadas (rafts) headed for the natural pools. Rua Doutor Antonio Gouveia, Pajuҫara Beach. The most popular boat-tour itinerary in Maceió visits 9 of the 32 islands in the Lagoa Mundaú and Lagoa Manguaba lagoons. Several boats make this two hours trip, leaving daily from Pontal da Barra at 9:30am and 3:30pm. The undisputed highlight of each tour is a visit to the dazzling point where the waters of the lagoons and sea meet. Also popular are the interesting stories about the islands that guides share along the way. For example, Ilha do Fogo ("Drunk's Island") earned its name from the tipsy workers at the cachaҫa distillery that once operated there. The longest coral reef in the country starts at Praia Paripueira, 32 kilometers from Maceió. At low tide, you can walk almost a kilometer out to sea with the water coming up only as far as your knees. Biologists accompany the catamaran trips to the reefs, which last about two hours (including a stop for diving). Tickets for the trips are sold at Restaurante Mar e Cia. Always confirm departure times with the restaurant, as they vary depending on the tides. 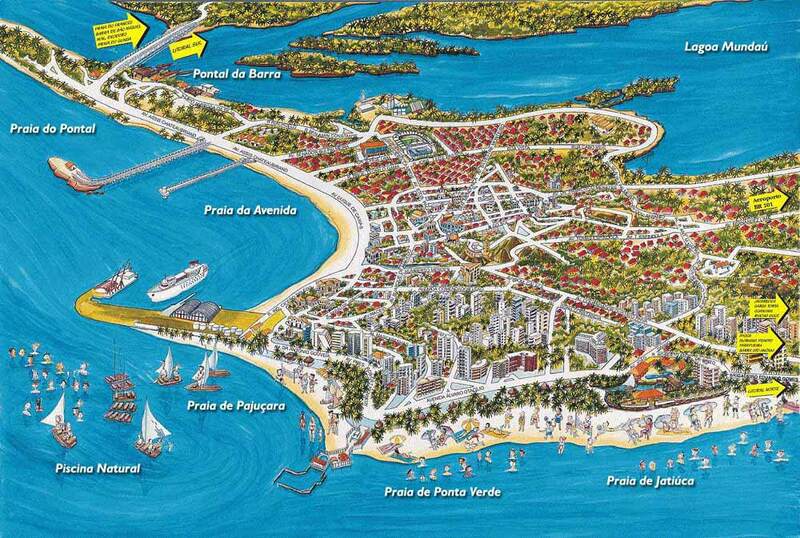 Near both the city center and Praia de Pajuҫara, Jaraguá was for centuries the most important neighborhood in Maceió. The area first rose to prominence in the 1500s as a stop for ships on the brazilwood trade route. Growth continued with the sugar trade, and by the 19th century the neighborhood was full of large townhouses and luxury goods stores. Jaraguá eventually fell to disrepair as a result of economic decline, and became a seedy redlight district. Thankfully, since 1995, a well-organized project has taken major steps to revive the neighborhood. The government declared it a National Historic Site, and tourists have begun to visit the area . The old town houses and ware houses are now popular bars and nightclubs. One of Jaragua's landmarks is the neoclassical Associaҫão Comercial de Alagoas building, built in 1926 by designer Jose Paulino de Albuquerque Lins. Echoing its architectural style is the Museu da Imagem e do Som de Alagoas (also known as Misa), an image and sound museum. The building dates from 1869, and it housed the city's old Customs and Excise building. Today Misa hosts both permanent exhibits and a rotating roster of live events in its upstairs auditorium. The Customs and Excise Tax building is also home to the Museu Theo Brandão, a museum dedicated to folk culture and traditions. Local doctor and folklore specialist Theo Brandão (1907-1981) donated most of the pieces in the collection, which focuses on folk art and clothing from the Northeast, as well as other regions of Brazil and even Spain and Portugal. There are several outstanding examples of local artwork, including the anthropomorphic clay jugs made by Júlio Rufino and the ceramics of Mestres Vitalino and No Caboclo. An auditorium in the museum features folklore presentations every Thursday at 7pm. Avenida da Paz, 1490. The Museu de Artes Pierre Chalita has more than 3,000 works in its exhibits, including paintings, silverware, and furniture, with a fo cus on the 18th, 19th, and 20th centuries. The basement features works by modern Brazilian painters. Baroque objects occupy the first floor. The second floor is dedicated to paintings by the artist who gave his name to the museum. Praҫa Marechal Floriano Peixoto, 44, Centro. Some of Maceio's most talented folk artists sell their wares at the craft market Mercado de Artesanato da Pajuҫara (Rua Melo Morrais, 617, Levada). The Núcleo Artesanal handcraft center in Pontal da Barra features more than 250 stores and studios. This is one of the best spots in Alagoas for traditional file lacework, in which reendeiras (lacemakers) weave fine, colored threads into intricate patterns supposedly inspired by fishermen's nets. The Pavilhão do Artesanato (Avenida Silvio Vieira, 1447, Ponta Verde) looks like a shopping mall, the pavilion has around 150 craft stores, a food court, and an Internet cafe. The market is an excellent place to browse items made of ouricuri palm straw (from the town of Coruripe, in Alagoas), as well as pieces from other states in the Northeast. If you visit just one place, make it the Armazém do Sebrae, a warehouse in Jaguaré (Avenida da Paz, 878), where you'll find lace, embroidery, sculptures, mats, and bedcovers. The Atelie Viver de Arte studio (Rua Manuel Maia Nobre, 257, Farol), run by sisters Rosa Maria Piatti and Ana Maria, features painted ceramics, bags, and home furnishings. A centerpiece of the region's cultural landscape since its inauguration in 1910, the Teatro Deodoro continues to produce plays and concerts. The theater is named for Alagoas-born Deodoro da Fonseca, military commander who became Brazil 's first president. The ornate interior has velvet seats and bronze detailing on the ceiling. Praҫa Marechal Floriano Peixoto, Centro. The state of Alagoas was the site of the greatest slave revolt in Brazil's history. The leader of the revolt was Zumbi, a slave of Angolan descent born in 1655 in Palmares, about 70 kilometers from Maceió. Baptized as Francisco and raised by Father Antonio Melo, Zumbi learned Latin and served as an altar boy as a child. At fifteen he ran away from his protector and took the Bantu name he is known by today. When he returned to his native Palmares years later, Zumbi joined a rapidly growing community of quilombos (settlements of escaped slaves), named União dos Palmares. Its members strived to keep traditional African culture and folk ways alive. As the community grew (reaching 30,000 members at its peak), it survived by raising animals and crops on small farm plots. the quilombos handily defeated the government's troops for decades. The men of the quilombos were victorious until 1694, when Zumbi was wounded and the Palmares community was destroyed. Zumbi returned a year later at the head of the army, but was soon betrayed by one of his commanders and captured by the government. He was executed in Viҫosa on November 20th 1695, and his head was displayed in the public square of Recife as an example for other slaves thinking of defying their masters. The date of his execution is now celebrated in Brazil as the Dia da Consciencia Negra (Black Awareness Day).